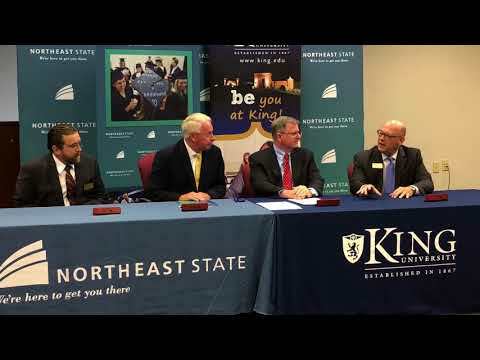 BLOUNTVILLE — Northeast State Community College and King University have entered into a dual admissions agreement, a first for King, although its similar to agreements the four-year school has with other community colleges in the region. “This is finalizing some of the things we were doing already,” NSCC Interim President James King told reporters. The agreement guarantees that King University will accept NSCC students in the dual admissions program. King and Alexander Whitaker, King president, signed the agreement Tuesday morning at the library on the main NSCC campus. Under the deal, students at NSCC will be able to enroll at King starting their third semester and get NSCC credit for King classes as well as NSCC transfer credit from appropriate courses toward a four-year degree at King. In addition, dual enrollment students who earn credit at King can have them transferred to NSCC toward their two-year degree there. “The focus of this agreement is the students,” Whitaker said before the signing. He said academic advisers will be at both schools to make for a smooth transition. Among other things in the agreement, participants must maintain at least a 2.0 grade point average. Other schools that have similar articulation agreements, but not dual admissions, with King are Virginia Highlands, Mountain Empire and Southwest Virginia community colleges in Virginia and Walters State, Pellissippi State and Roane State community colleges in Tennessee. Whitaker said the dual admissions model may be used to modify agreements with those schools and for agreements with additional schools. King said NSCC has seen an influx of students with the Tennessee Promise, which provides two years of tuition at no cost to Tennessee high school graduates, meaning “some of the best and brightest students in Northeast Tennessee started here” and transfer to four-year schools like King and others. He said in May, 61 graduates walked across the stage with a 4.0 grade point average. Whitaker and King credited Sam Rowell, vice president of academic affairs at NSCC, and Matt Roberts, chief academic officer and vice president of academic affairs at King, with working out the details of the dual admissions agreement. After the signing, King said dual admission will be important to “a lot of students” and that “anytime you can make life easier for an 18- or 19-year-old” is good. “We’ve always had a great relationship with King,” the NSCC president said, while Whitaker said making things “seamless and natural and easy” is the goal of the agreement. Although King has waived its admission fee for all students, Whitaker said that if King reinstates that fee in the future, dual admission students would be exempt from it. He said that King officials anticipate most NSCC dual admissions students would attend the main campus in Bristol, Tenn., although he said they could utilize any King facility that offers appropriate courses or online courses. However, Whitaker said dual admission students are not locked into going on to King.